8 PM under the freshly sprouting branches of a truly ancient oak growing on a shelf above the tracks in a bend of the south fork of Stenner Creek. Everything here is still green, horsetails and watercress and sedge and rust and yellow monkey flower in the flat marshy area. This tree a grand surprise as I walked slowly, slowly in the late sun looking for a perfect place to lie after a relentless day of reading the second set of student journals and essays, many of them excellent, one that I spent two and a half hours with. Followed by the class field trip to Cheda—easy now, with students having plenty to say and reading Troutman and talking Lovins, and finding the wriggling tail of an alligator lizard and picking it up to show. 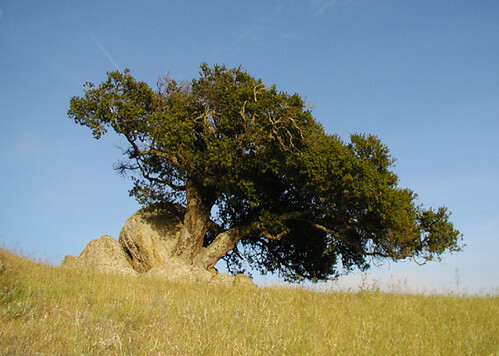 This vast tree, so old with such new and vigorous sprouts. When Jan departed for Tassajara, I took leave of her as if it could be forever, seeing her this morning beautiful and clear. A jet below the crescent moon makes a brilliant vapor trail in the colorless sky, a cloud of gnats dancing in front of me not interested in blood. The afterglow from class, students ranged at many distances talking quietly, writing, staring. 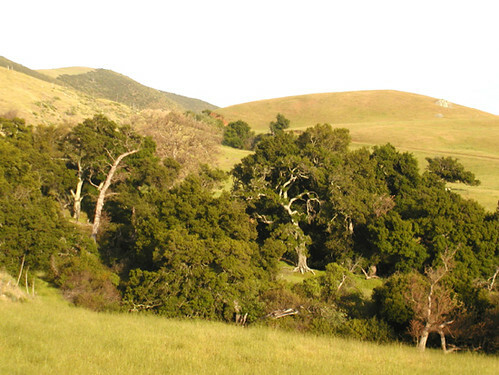 Tomorrow I meet with someone from RMI to strategize about having her consult with Cal Poly to promote sustainability. At night a party at my house for Writerspeak visiting novelist, before that an opening of Andy’s show at the gallery and on Saturday a reception for the student volunteer of the year and her mentor, me. The darkening evening is damp and cool, the sound of the distant freeway drowned out by the train just below this hidden garden. Crickets join the meadowlarks. The vapor trail pales and the crescent moon brightens. My tired feet aching to get out of boots. Comfy in sleeping bag on Thermarest chair. Dark grey fog, like smoke coalescing in the west. Where is the wildlife? I haven’t moved in an hour. Two planets flank the moon. The stars are pleasure points. The fog gone and so are the gnats. Pink and blue on the horizon. I take pictures almost daily. How will I manage them? Does preserving the past make it stale? I prefer that to losing it. Seabreeze in the blond oats, curves of the railway as graceful as the swoops of a swallow. Wind and water and birdsong. 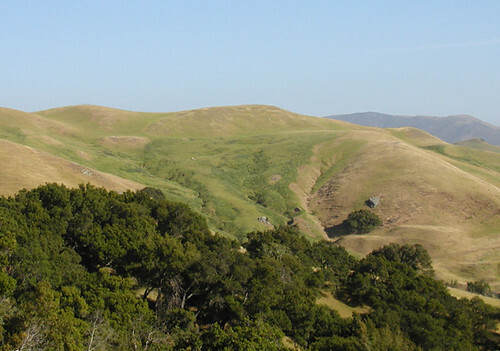 A west-facing hillside. Thick green light and dark set off by straw-colored grass. Andrew asks, “Are there peacocks up here? I just saw one.” I remember encountering a peacock by the old homestead behind the eucalyptus grove. 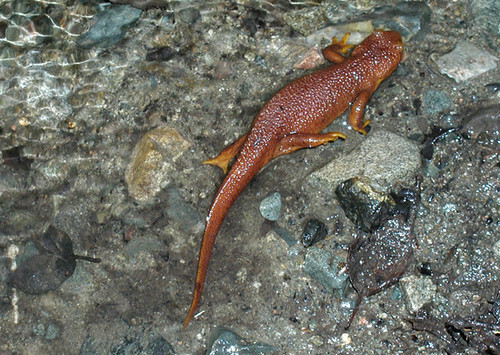 Crossing the creek by the big cypresses I found a newt. Two grand circling red tails as came above the tracks. 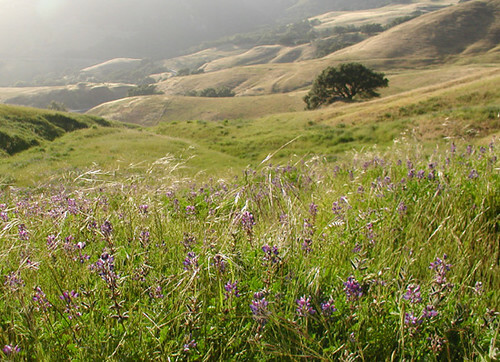 turned out to be great patches of lupine–dark green of the leaves and purple of the flowers. Sitting at the base of oak rock, a tree growing out of a crack in a sculpted outcrop of conglomerate waiting to see a quadruple conjunction of planets in the west. But the fog comes in as the light recedes and just a few shreds of blue transparence remain behind the gathering grey curtain. From one rock to another a straight arrow trail in the grass uniformly three inches wide as if made by a mechanical herbicide dispenser, connecting one underground city of gophers to another. This shelf above Stenner canyon thick with springs and marshes releasing water from the chapparal steeps above. Huge sycamores and oaks directly below. This morning making coffee in the dark without my glasses, a sharp prong of light appears above Cuesta Ridge. Not the sun or the moon. A new being in the heavens? I get the binoculars and look again, recognizing a curve on the dagger-like spike. The nail-pairing of a crescent moon almost vertical clawing the sky. You are currently browsing the archives for May, 2002.